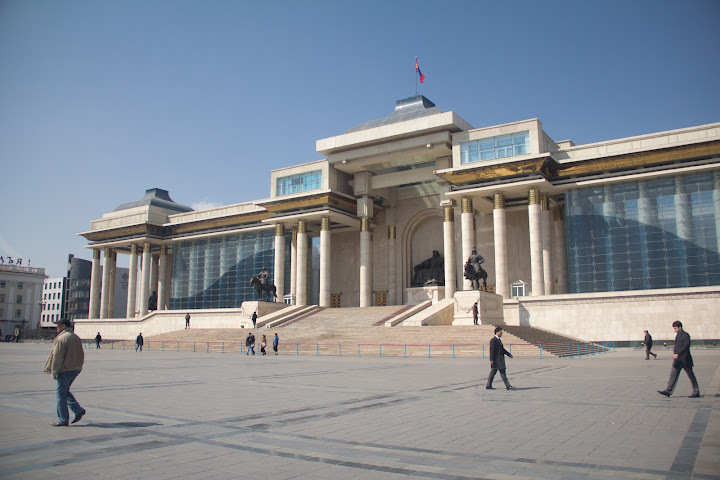 The Mongolian Parliamentary elections are taking place on June 28, just two days away. While the election cycle is considerably less lengthy than I’m used to back in the States (candidates campaign for a maximum of two months here compared to the year and a half I’m used to), the parties are now out in full force. Everyday I see vans drive past adorned with party flags and faces of candidates plastered to the windows, blasting music and party slogans. When I’m home during the day, someone will inevitably knock on my door with party propaganda, look a bit confused when I open the door, and then just turn around and leave so as not to waste their time on a non-voter. But the thing that I’ve enjoyed the most about the campaign season is the advertising. Campaign commercials have always been my favorite part of the run-up to elections. I still remember my favorite spots from the U.S. presidential election in 2008: some post-modern videos produced by the Mike Gravel election team. As I’ve been in Mongolia for most of the 2012 campaign and Republican contest, I have missed a lot of the gems being broadcast back home. And so when I started seeing what the Mongolian campaigns were producing, I was instantly intrigued. I think the thing I enjoy most about campaign commercials is the insight they provide into the larger trends in a nation. Each party is trying to succinctly express the values that they represent while inciting the populace to adopt and support those values. They have to both broadcast their intentions and respond to the cultural and philosophical trends of the day. Watching the videos put out by the two main parties in Mongolia, Mongol Ardiin Nam (The Mongolian People’s Party, formerly the Mongolian People’s Revolutionary Party) and Ardchilsan Nam (The Democratic Party) has been an incredibly valuable way for me to better understand the goals, passions, dreams, and frustrations of Mongolia in 2012. It’s a succinct window into the national identity. Largely, the commercials have been reaffirming some of the ideas I’ve developed about Mongolian national identity in my time here. However, it’s much more difficult to get an average, non-political, citizen to articulate their own nationhood. And so many of my theories about what it means to be Mongolian today have, until now, remained tentative. The themes that emerge from the campaigns (on both sides) are very in line with my own observations as an outsider. The desire to unite as Mongolians, the feeling that a bright future is within reach, the notion that it is only a matter of time until Mongolia is on par with the developed world, the connection to ancient Mongolia and harnessing the strength of Chinggis Khan, and the notion that although we are small, we are mighty. These ideas have all come out, much more subtly, in interviews and interactions I’ve had throughout the past eight months. I hope that by sharing a few of these commercials, I can help shed some light on the Mongolian understanding of nationhood to you, my foreign audience.